BAHAMA BREEZE is NEW to our program -- available NOW. Take advantage of our 'New Property Special' rates for Spring Break and Summer. Book today and plan your 2019 spring break and summer vacation now!! You'll enjoy vacationing in BAHAMA BREEZE. (Maravilla 1411). on the top floor of Building #1 at popular Maravilla in Destin. Bahama Breeze is a short walk to the crystal clear blue waters and sugar-white beaches of Destin. the 4th floor of popular Maravilla in Building #1. Enjoy an Island Inspired decor in Bahama Breeze. 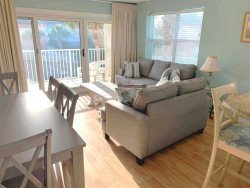 You will love this Destin Vacation Condo. Book online today for your SPRING OR SUMMER VACATION! New Property Rates for Spring -- check it out! Open for rental: March 15, 2019.